This lightweight, battery operated bicycle safety light comes with everything you need to keep you safe while riding your bicycle. 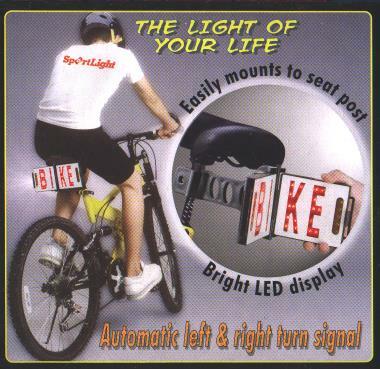 The safety light easily mounts to your bicycle seat post and bright LED display spells out the word BIKE which can be seen for over 200 yards away by oncoming vehicles. Automatic left & right turn signals are built into the sign to offer extra protection. The safety light requires 8 AA batteries that are included and will give you up to 50 hours of usage. The safety light folds shut when not in use to save battery life. The safety light kit comes with everything you need, the sign, mounting hardware and batteries. The sign has two sections and measures in at less than 10 inches wide (about 4-3/4" per section) and stands about 4-1/2" high. The letters are 3-1/2" high. 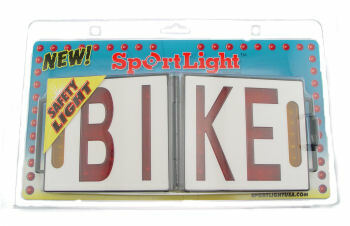 The turn signals are 2-1/2" high and are located on either side of the word BIKE.